Sharp’s 70-inch Aquos LC-70UD1 Ultra HD LED LCD TV. 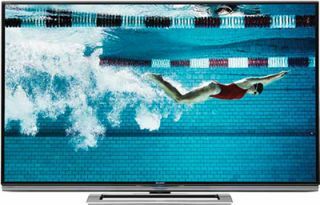 At the 2014 International CES Show it appears that the spotlight will move from 3DTV to the Ultra High Definition (UltraHD, or UHD) video format, popularly known as 4K. After rolling out UHD at last year’s show, manufacturers have announced a slew of product releases for the New Year, supported by keynote speeches and conference tracks during the convention. There is already a groundswell; computer manufacturers and software developers have been releasing 4K-capable products for some time, and companies such as Sony, with their RED cameras, have the ability to capture UHD content. But whatever the content, there are still technical hurdles where distribution and display are concerned. Take cabling, for example. Some products offer only HDMI connections, and only support content at 24 frames per second or 30 fps. Other products interconnect using four HDMI cables (UltraHD offers four times the resolution of 1080p). The computer world has adopted DisplayPort 1.2 as an alternative; it, like the newer HDMI 2.0, transmits UHD at 60 Hz. Content may be easier to come by these days, but there is an oft-overlooked cost, according to Howard. Content needs updating, and for UHD that can be expensive. In addition to themed entertainment venues, the applications for 4K are pretty much as expected, according to Steve Seminario, senior director of product marketing for Planar Systems, which offers an 84-inch 4K display, Planar UltraRes, in three versions, with a six-point touch option for each. “We’ve sold a lot into those markets that have 4K computer-generated data,” such as CAD, the oil and gas industry, power management, and governmental and military applications, he reported. The price of a single 84-inch 4K screen is roughly equivalent to four 1080p displays, but has no bezel cross in the middle, Seminario also noted. “On the professional side, we have even more reason why our customers really need 4K, as opposed to somebody at home. So we’re really anticipating a pretty aggressive move where the common resolution becomes 4K,” he added. There is general agreement that the way for AV integrators and consultants to get a piece of the 4K action is to educate themselves and become a go-to source for their customers. “A lot of the question marks come when I’m talking to some AV integrators,” said Seminario. “How do I drive this? Can I do 4K at 30 Hz over a single HDMI 1.4, or do I need an Nvidia K5000 with four outputs? Wait, Did You Say 8K?! A conversation with an end user should center on his or her specific need or desire for high resolution. Simply due to the massive bandwidth requirements, 8K is an enormous leap in technology that will be slow to evolve. “More is better” doesn’t necessarily apply in this debate, so the customer needs to be educated about the pros and cons of 8K versus 4K, or even HD. Once the added cost is eliminated as a factor, the integrator needs to delve into the source materials and the installation environment. Today, since there are no sources available for generating those resolutions, a customer cannot actually realize the benefits of installing an 8K system. Even more important is the fact that we don’t even know what signal type or connection type will be employed. Too much about the technology is unknown right now for an integrator to guide a customer to a credible solution. When image quality matters, you want the highest available resolution. We all remember the tremendous push to deliver HD to replace SD, starting at the high end and quickly becoming the de facto standard for projects small and large. In particular, the medical and imaging markets demand the best possible image, so the demand will be strongest there. Widespread adoption of 4K content for broadcast and commercially produced content is still a ways off, and 8K will be even further as standards and bandwidth are simply not going to be ready. While I would fully imagine that the homeowner will be slow to adopt the 4K evolution, at Atlona, we are seeing incredible traction within targeted verticals on the commercial side who are fully embracing the technology. Why? Because their businesses depend on the most advanced resolutions to be effective within their respective industries. Visualization centers, medical facilities, and command centers all utilize the highest possible resolutions for business critical decisions and research. They do not have the luxury to “wait” for 8K. Recently, use of 84-inch diagonal 4K commercial displays has ramped up to become quite mainstream. This is not a surprise to anyone who’s seen the large demand for small video walls—like 2x2 of 46-inch or 55-inch super narrow bezel LCD—over the past five years. In a single large 4K display, users get a seamless solution sized perfectly for many collaboration rooms and offering a stellar image even at up-close touch distances. The four-fold leap in resolution means that, for now, capturing, storing, and distributing 8K content requires a significant investment. Integrators should therefore tell [customers] to wait and see: Wait until a true standard for 8K is implemented, and then, see if their audiences can actually tell they’re seeing more pixels. Considering the pace of technology, the only thing certain about 8K is that, by the time it becomes standard, everyone will probably be talking about 16K!